I read this article and found it very interesting, thought it might be something for you. The article is called Gleaming The Cube: Skating as sport or culture, and when it’s time to retire and is located at https://www.totallydublin.ie/more/opinion/gleaming-the-cube-retirement/. In the last number of weeks, the realm of world sport has been shaken by the announcement of numerous high profile retirements—ageing stars who have come to the realization that they no longer had the base physical capabilities to keep up with the young lads. These sportsmen’s decisions to retire the way they did draws into focus the sharp contrast between the career arc of those who compete in mainstream sports with those who made their name as professional skateboarders. In a sense, these recent developments make all the more obvious the distinction between skateboarding as a culture and “sport” that is so often lumped in with, albeit with the “extreme”, “action” or some other redundant prefix wedged in before the S word. To anyone who has been granted anything more than a cursory X-Games-centric exposure to skateboarding culture, the “Sport” tag has always been a less than entirely comfortable fit. 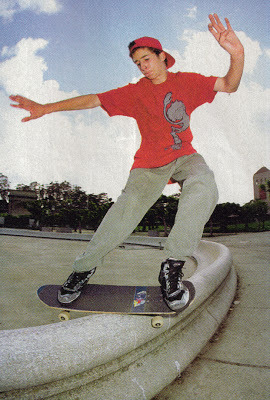 Though sincere engagement with traditional sport allows for a similar level of subjectivity in analysing the quality of any given player, one cannot overlook the significance of competitive success in determining a sportsman’s worth—something that is far from true when considering the output of any skateboarder, let alone some of the best (or if not “best”, certainly most significant) skateboarders who have dominated the industry for decades. After maintaining positions at the fore of a culture that is ever evolving not just in terms of aesthetics and business concerns outside of the act itself, but also in the tricks that make up the meat of activity itself. Unknown youngsters are now not only perfecting tricks that were inconceivably complex only a handful of years ago, but they have now reached a level of proficiency where they could probably recreate trick for trick the skate parts that cemented the reputation of those that are now industry figureheads. Tricks that blew minds in the 90s and legitimised the position as pro of young men that are now company owners pushing 40 are, if not basic to the 16 year olds of today, certainly achievable with practice. A far remove from the sorcery they were first considered to be. Many pros undoubtedly feel that their situation is in some respects comparable to that which made these elder statesmen in other fields feel that they couldn’t compete and had were left with no choice but to throw in the proverbial towel, That they simply are no longer physically capable to keep up with the younger generation. Though to take this view of what is expected from or necessary to be a pro skater is to lose sight of the particularities that make skateboarding culture so distinctive and special. Using the phrase “can’t compete” when discussing the relationship an older pro has with an up and comer is perhaps the wrong starting point. Ultimately the peculiar understanding of the nature of competition or rather lack of competition within skateboarding is what sets it apart from other fields concerned with physical activity. It could even be said that the only people that view it as a contest at all are the ageing pros themselves. The strain of competition is, if not entirely imagined, certainly a much more significant concern in their greying heads than in those that so eagerly consume any output from the “greats”. In traditional sports, one’s legitimacy as a competitor is all too easy to determine: it comes down to results. At the end of any contest there is a winner and a loser, but skateboarding isn’t like that. Some of those considered the best there ever was have never been known to enter a skateboarding contest. Any competition between two pros is in essence imagined rather than imposed by any given set of rules. Even in comparing two skaters doing the same trick on/off/over/around the same obstacle there is no means by which one version of the trick can be deemed unquestionably superior to the other, or potentially more significantly, even if one skater does a technically speaking more complicated or challenging trick than another even then the idea of it being “better” than the more basic trick is missing the point. There is no “better” in skateboarding when every piece of skateboarding output (taking output to mean photos or video) is so context sensitive. Which is something that one would struggle to say about any action that takes place in the oppressive glow of a scoreboard. The context that defines a trick’s worth is not just made up of concerns outside of the individual performing. Concerns like geographical position affecting the difficulty of the trick or even more abstract personal notions of style but also factors that are entirely a reflection on the who of what we are seeing not just the where and the how. The satisfaction in seeing a particular skater who carries with them the weight of their own personal history performing even the most basic of tricks is of no small significance to the discerning long-term skate obsessive. And this is at it’s core the idea that seems to so often escape the ageing pros who feel they can no longer “keep up”. Perhaps it’s a little unfair to say that the idea escapes them. To some extent the idea that they would rather not release any footage as opposed to releasing footage that is not on par with their best is admirable. Though this logic is less than entirely water-tight when you consider that so many of the same skaters that consider it un-couth to release footage they deem to be sub-standard in relation to their output a decade or so ago appear to have no qualms carrying on selling products with their names on them without the corresponding new footage to legitimize the continued production of pro branded product. Though it might perhaps be unfair to criticise these pros whose role in progressing skateboarding over the years is undoubtedly secured. It is probably helpful to consider the continued production pro product like this through the lens of an argument presented by Patrick O’Dell made in the John Cardiel episode of Epicly Later’d. He posits that continued production of John Cardiel pro boards after his career-ending injury is akin to brands still putting out Micheal Jordan or Mohammad Ali products. Through their past achievements in their respective fields they have created a demand for product even if they are not functioning at the same level of proficiency they always have. Consumers want to associate themselves with personal brands of skaters who even though they are far from functioning at the peak of their powers remain key figures within the industry. One could argue that there will always be a demand for Rick Howard boards regardless of what he is doing now in terms of output due to what he has done previously, so if the demand is there, why not cater to it. This argument is hard to argue with but so many pros of Howard’s vintage seem to ignore the fact that a similar demand exists for new footage regardless of the quality and if he is still capable of producing footage of him cruising around a park or just dorking around the streets then why not? People want to see it so why not release it? The argument that a reputation needs to be preserved seems to give far too little credit to the audience that keeps up the demand for product. We all realise that in very few cases can skaters in their 30’s carry on releasing footage of the same quality or certainly the same cultural significance in terms of progression as they could in their 20’s but in a culture that so values concerns outside of the objective “best” then surely there is no harm keeping up some level of video or photo output. It is almost detrimental to the artistic conception of skateboarding to see so many of the men that helped foster this style-focussed understanding of what makes skateboarding worthwhile feel they can no longer promote themselves through skateboarding because they can’t compete with whatever new ledge dancing/stair chomping robot that is fresh off the production line of California’s skate plazas. I suppose you’d have to ask the men themselves what it is about getting older that drives them to give so much more credence to a competition understanding of the role of a professional skateboarder. One hopes that we haven’t seen the last of some of the greats and as sad as it is that we might have it is all the sadder to think that the men that inspired the banner pros of today are now for want of a better word embarrassed to release footage despite the throngs of baying beard-strokers that just want to see Rick Howard noseslide a ledge. Just one, Rick. For old time’s sake.